It’s a pretty good video. I found it interesting to visit some of the groves. And the comparison of the grove locations to his book introduced food for thought. YOu are welcome. 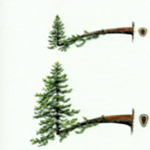 I like the image you have on your page which seems to look like a redwood stem reiterated from a horizontal limb. Similar to Kronos mentioned in Preston’s book.